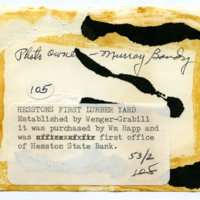 Hesston's first lumber yard established by Wenger-Grabill it was purchased by William Rapp and was first office of Hesston State Bank. 53/2 105. photo owner - Murray Bandy -- on back of photograph. 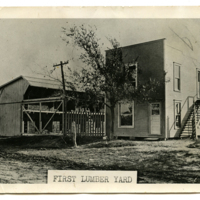 unknown, “First lumber yard,” Hesston Public Library, accessed April 19, 2019, https://hesston.digitalsckls.info/item/1366.